On desktop computers install client library applications, you have access to all library functionality from each client computer (cataloguing, checking in, checking out, and processing data) (desktop computers with Windows). There are four client library applications: library main application, search module, data entry module, and check in/out module. All are Windows applications. 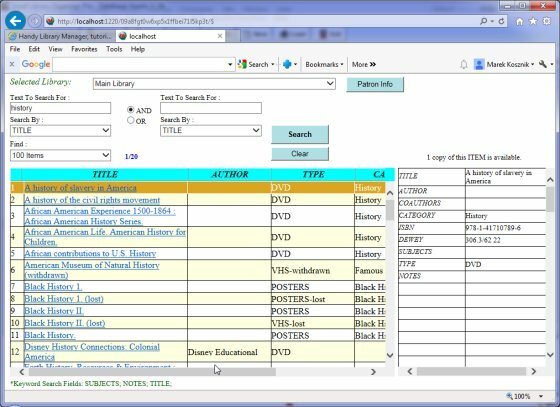 All library databases (main catalogue table, users table, loan transactions table,) are stored on the server computer. Each client loads data from the server computer. All data changes, transactions, new records, options are stored centrally on the server computer. Each client has access to the same set of databases. Web Search Module and Mobile Search Module are Web applications; you can access them from any device that has a browser and the Internet connection. Server Service Monitor is installed on the server computer. 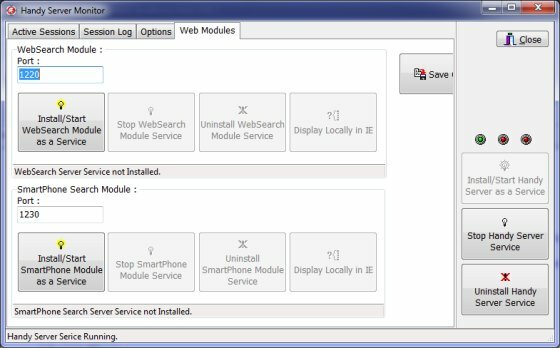 This application installs/uninstalls server services (library main service, web search service, mobile search service). 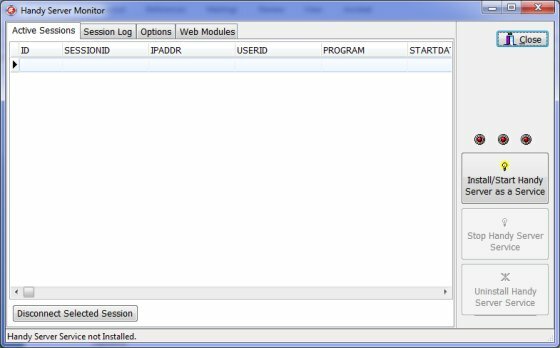 Install/Start Handy Server as a Service: installs library service application, according to your settings library databases could be accessed on client computers over the web or on your internal web server. Stop Handy Server Service: stops library service application. 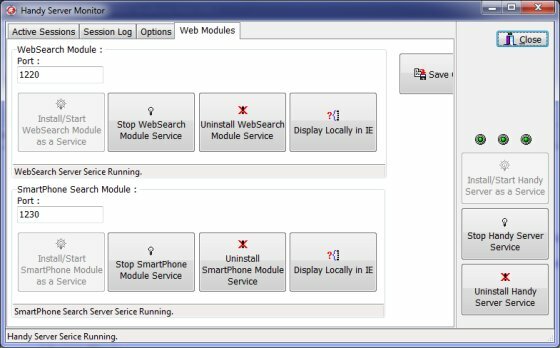 Uninstall Handy Server Service: Uninstalls library service application. Disconnect Selected Sessions: Disconnects selected client computers from accessing library databases. Green light: service application is running. There is one active session (one desktop computer connected with the library server). 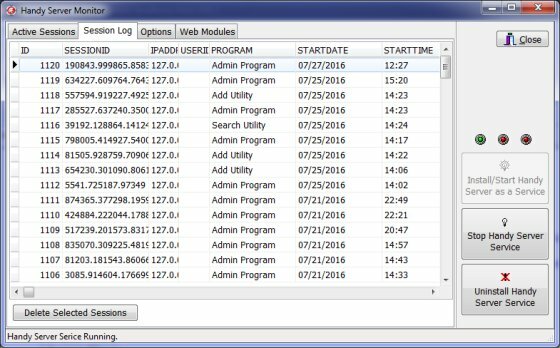 Session log displays history of all sessions. 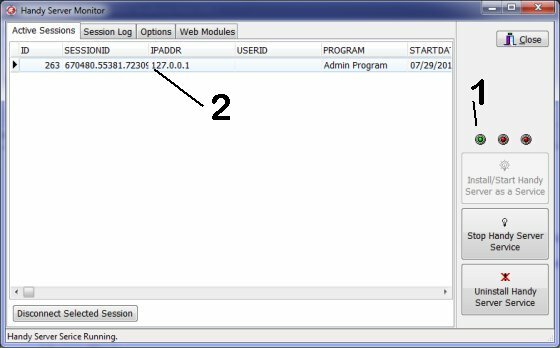 Limit access to library server from desktop computers by defining Allowed IP Addresses. Install services that activate Web Search and Mobile Search modules. Green lights: Web Search and Mobile Search services are activated. Handy Library Server is using 3 server Ports: 930, 1220, 1230. 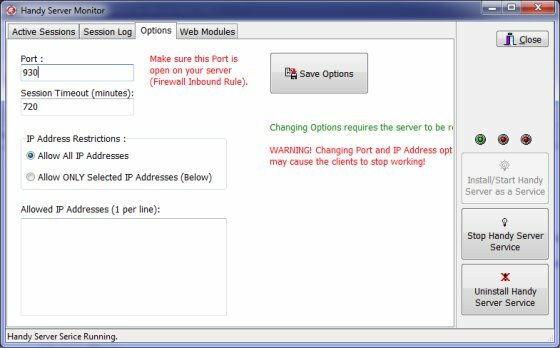 The above Ports should be opened by creating a Firewall Inbound Rule. What are requirement for the cloud version? Answer: It can be any Windows server that has a permanent IP address. It doesn't really have to be a web server. There are no special hardware requirements. How library cloud/server application works? How to install library services?